Click on the image to explore median single-family home sales prices by month. PHOENIX – Demand for houses in Maricopa and Pinal counties declined in July compared to the same month of 2013, but that shouldn’t be read as a sign of another housing bubble, according to a report by Arizona State University’s W.P. Carey School of Business. “It’s kind of the opposite of bubble,” said Mike Orr, director of the school’s Center for Real Estate Theory and Practice. According to Orr, a typical housing bubble involves extremely enthusiastic buyers hoping to re-sell homes at a profit and pushing prices to unsustainable levels. The current market lacks that kind of enthusiasm, he said. “Not enough buyers nor enough sellers for it even to be called an average market,” Orr added. According to a summary of the report, for which the school sells access, sales of single-family homes were down 19 percent in July compared to July 2013. Meanwhile, the median sale price for a single-family home was $210,000, up 8.2 percent from $194,000 in July 2013, it said. Lower demand usually produces a larger supply of homes for sale, but that wasn’t the case in July, according to the summary. Orr said lower demand from investors is making prices more stable. Due to competition and thin margins, investors accounted for 14.4 percent of residential property sales in July compared to a peak of 39.7 percent in July 2012. The summary said that options were “pretty slim” for those seeking to buy houses for less than $175,000, in part because bargain foreclosures were rare. Completed foreclosures on single-family homes and condominium units were down 45 percent in July from the year before, it said. New-home sales saw better results in July, accounting for 12 percent of the overall total, up from 9 percent in July 2013, according to the summary. Bobby Lieb, associate broker at Valley-based real estate agency HomeSmart, said the market has started to favor buyers recently. Lieb said he believes home values and demand will be strong over the next year. 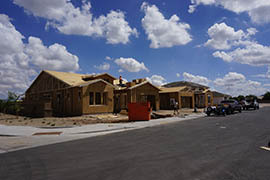 A home under construction in Gilbert in 2012. A report by Arizona State University said home sales are slowing down, but it said that doesn't suggest another real estate bubble.